Every baker has a comfort zone. I am no exception. But every once in a while, I feel the urge to challenge myself to try a difficult sounding recipe or a difficult to achieve baked good – if only to be able to say that yes, I did try making XYZ once. Not only that, but so often I find that the things we think are difficult may not be quite so bad after all. Although, other times we just lack the experienced hands of someone who has been baking for a lot longer, but that doesn’t necessarily mean we should give up either. If I actually had the time and the resources to participate in the Daring Bakers monthly challenge, I would have joined long ago, as their mission resonates with me quite well. But since I am someone who mostly bakes with what I have available due to lack of shopping convenience, it would have been impossible for me to participate. Thus, you find me from time to time coming up with some difficult project to tackle on my own, which I find rather satisfying, since my personal growth as a baker and a cook depends largely on how much I can push myself to try new things. Still, I knew this would be a challenge before I even began. For one thing, I have made them before when I was in high school. I remember the first time I made them, the crust was soft but much too crumbly, leaving me with tarts that I could barely get out of the muffin pan. The second time I made these was also in high school, using a different recipe, and this time they came out with a hard, almost crunchy crust that was barely edible. 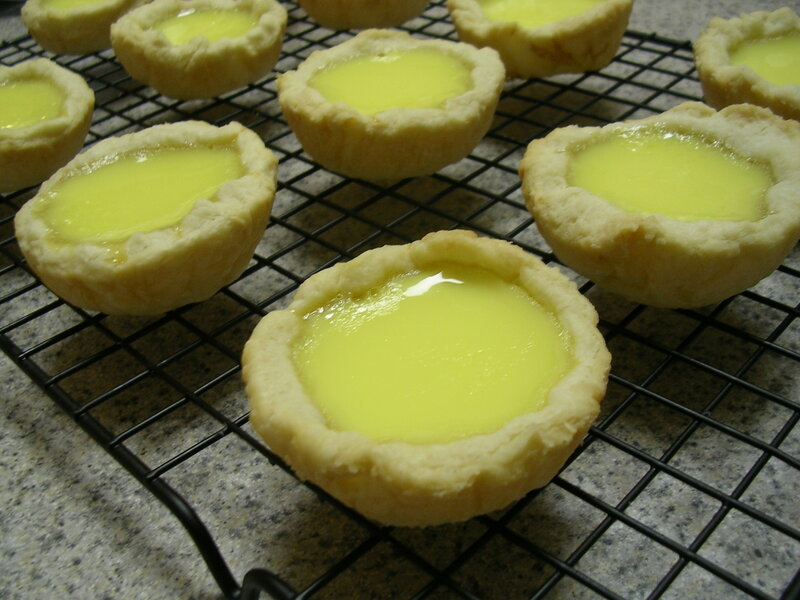 I moved onto other baking projects and soon forgot about making egg tarts. That is, until this week. I did a bit of recipe scouring and realized that in the past, I always made the tart crust from a single dough that included both lard and butter. But according to those in the know, to make a light flaky crust, you have to make it from a combination of two doughs – commonly referred to in the Chinese recipes as a “water dough” and an “oil dough”. 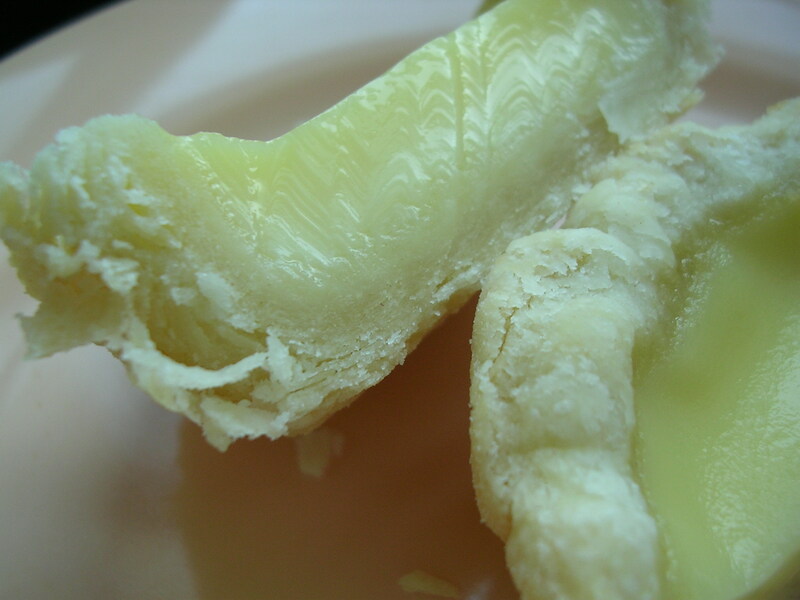 The two doughs have different compositions, and when rolled into alternating layers in the crust, separate during baking and form those wonderful flaky layers that are so coveted in the egg tart crust. 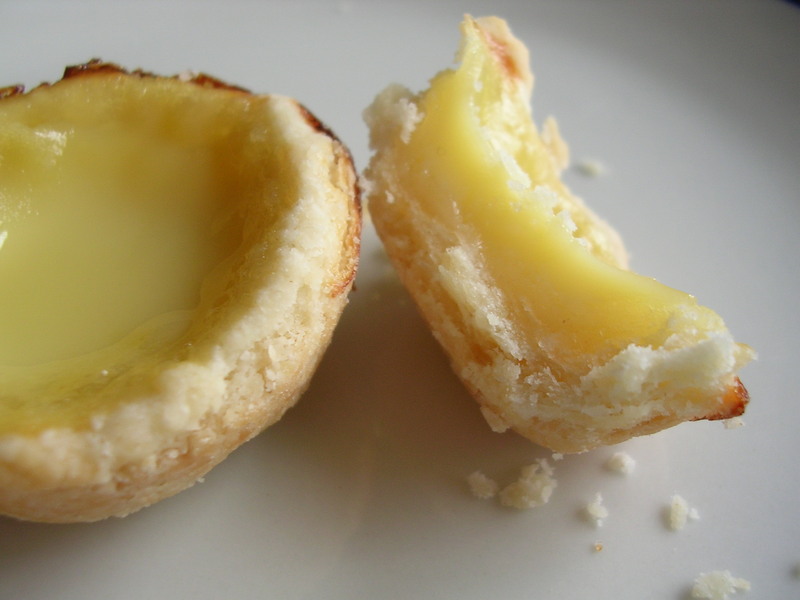 I followed a forum thread on eGullet that discussed the search for the perfect egg tart recipe, and learned a great deal through everyone else’s trials and tribulations. Although they ultimately did not come to a consensus on the best recipe, I did find one through that thread which I attempted – twice in three days. The first time my results were so-so, but the crust was a bit harder than desired, and not as flaky. With just a few tiny alterations and a slightly more experienced hand, the second attempt came out nearly perfect (at least for my standards of bakery style egg tarts). I used the crust from one recipe and the filling from another, as I was lacking a few ingredients. 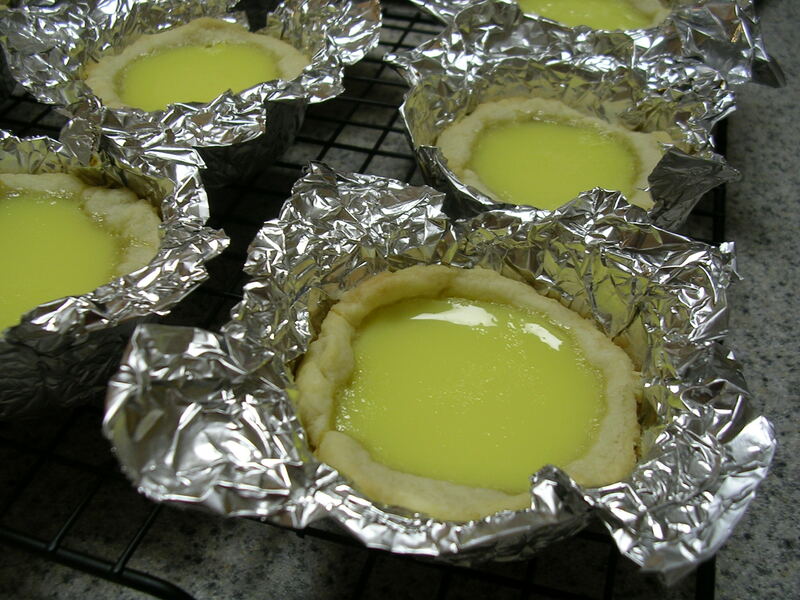 The custard filling of my tarts were smoother and creamier than the store-bought tarts, more like a custard/creme brulee rather than a flan. I personally liked it better this way, but your opinions may vary. 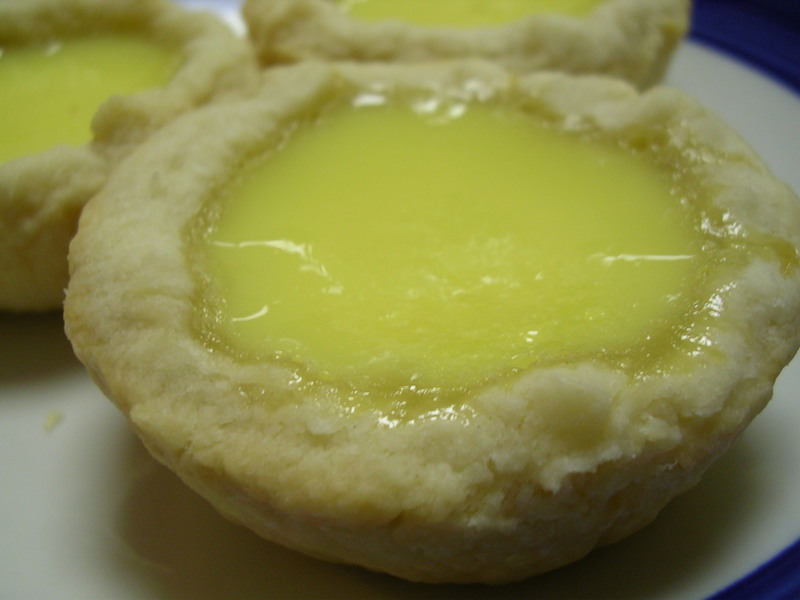 All I know is that these were heavenly right out of the oven… and the crust resembled the bakery egg tarts very closely. Success! Finally! 1. To prepare the water dough: place flour in a mixing bowl, make a well, add in sugar, beaten egg, and shortening. Mix well to get a crumbly mixture. Then stir water into the flour mixture until it just comes together to form a soft dough. DO NOT OVERWORK THE DOUGH (this is what made my crust tough in my first attempt). It’s okay if the dough is a bit sticky, but don’t stir it too much while you are adding water to form the dough. 2. To prepare the oil dough: place flour in a mixing bowl, make a well. Add softened butter and lard, mix well. Use your hands if necessary, as there is no liquid here to bind the dough. Just don’t handle the dough for too long, otherwise you’ll melt the fats. 3. Place both doughs in freezer until firm and solid. 4. While dough is chilling, stir together eggs for the filling in a bowl with a whisk until well-blended, but avoid creating bubbles. Stir in milk, sugar, and vanilla. Mix well and strain. Spoon off any remaining bubbles from the top. 5. Preheat oven to 350 degrees F. Line a regular muffin pan with foil liners or make your own out of squares of foil. 6. You may choose to do this step in 2 batches, so that the rolling will be a big easier to do in a small space. On a floured surface (avoid using wax paper for rolling, since the dough will stick), roll out oil dough into a rectangle, and the water dough into a rectangle twice the length of the oil dough (about 1/4 inch thick). Place the oil dough in the center of the water dough. Fold over both sides of the water dough on top of the oil dough and touch just in the center, as if folding in the pages to make a book (this is called a book fold). Roll out the dough flat as large as possible, about 9 inches in diameter. Fold into quarters, roll flat again. Repeat twice more. Roll dough out into a big rectangle, about 1/4-1/5 inch thick. 7. Cut out circles from the dough using 3 inch cutters (or cups/bowls with thin rims). Lay circles into muffin pan and flatten against sides evenly. Using two fingers, pinch edges of crust into little A shapes along the rim, to give the final tart a slightly crimped appearance. 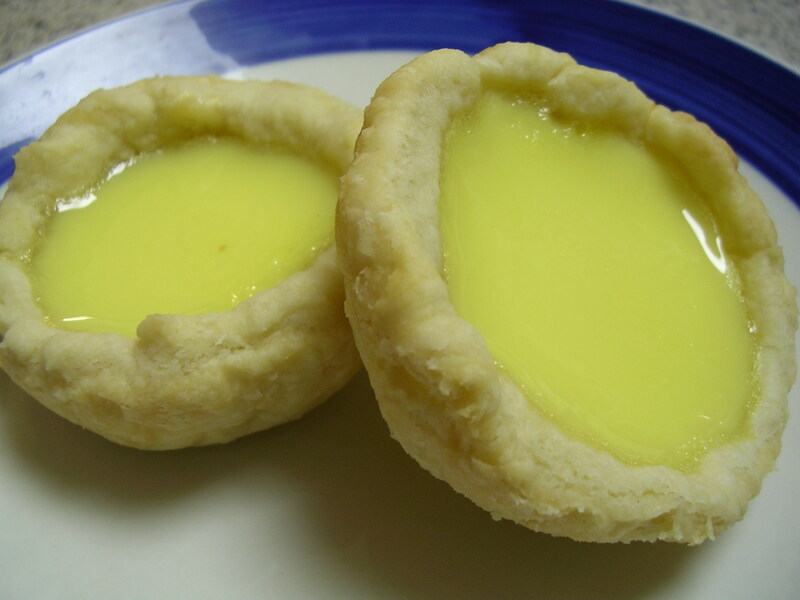 Pour in egg custard into each tart crust until it is about 80% filled (do not over-fill, as they will bubble over). 8. Bake in oven for 25 minutes, or until the crust just started to turn golden, and the egg centers have puffed up slightly. Remove from oven and allow to cool briefly – these are best served warm! I apologize for not having taken any pictures during the dough rolling process, which is probably the most confusing part. I had my hands in flour and dough, and wanted to roll them out quickly before they warmed up too much, so I couldn’t whip out the camera. Plus my technique wasn’t that great, I improvised a great deal when things didn’t go smoothly hehe. All I can say is that you shouldn’t worry about rolling the dough thin as you are rolling out the folds, and just envision that you are layering the oil dough and water dough into many many thin layers using this process, and it will make more sense. Look how beautiful the layers come out in the end… oh the fruits of your labor! So to share a little bit from my first attempt with this recipe… I overworked the water dough when I was stirring it together, as the recipe from the website did not give enough water for the dough to come together. I kept trying to stir it and definitely over-developed the gluten in the flour. I also made them in a mini muffin baking pan, using a 1.5 inch dough cutter, since I thought that bite-sized ones would be cute, like the ones I often see at dim sum places. However, I realized afterwards that the crust to filling ratio is too high in these tiny tarts, so they don’t taste as good as the regular sized ones in normal muffin pans. And of course, as I mentioned earlier, the crust was harder than expected, and a little bit crunchy, sort of like a shortbread (many of the simple one-dough recipes online call for you to make a shortcrust, so beware if you are searching for the authentic crust). So the first batch was a definite bust, although they were still tasty to eat as a treat – they just weren’t like the ones in the bakery. I had actually made double the amount of oil dough during the first attempt, so I saved that in the refrigerator, along with half of the filling mixture, and re-made the water dough recipe with more water this time and less stirring of the dough. So I know for sure that the only thing that changed between the first and second attempt was the forming of the water dough, and potentially a better dough rolling process. The only difference in the second dough rolling was that I made sure to flour my surfaces, allowing for easier rolling. The first time, my doughs were not fully chilled, and I used sheets of wax paper which caused a lot of sticking that was painful to deal with. You can probably tell from the picture below that the crust is a bit overbaked and the small size of the tarts (about the size of a half dollar coin) meant too much crust in each bite compared to the filling. This entry was posted on Monday, March 31st, 2008 at 4:54 am	and posted in baking, Chinese, desserts, recipes, Uncategorized. You can follow any responses to this entry through the RSS 2.0 feed. 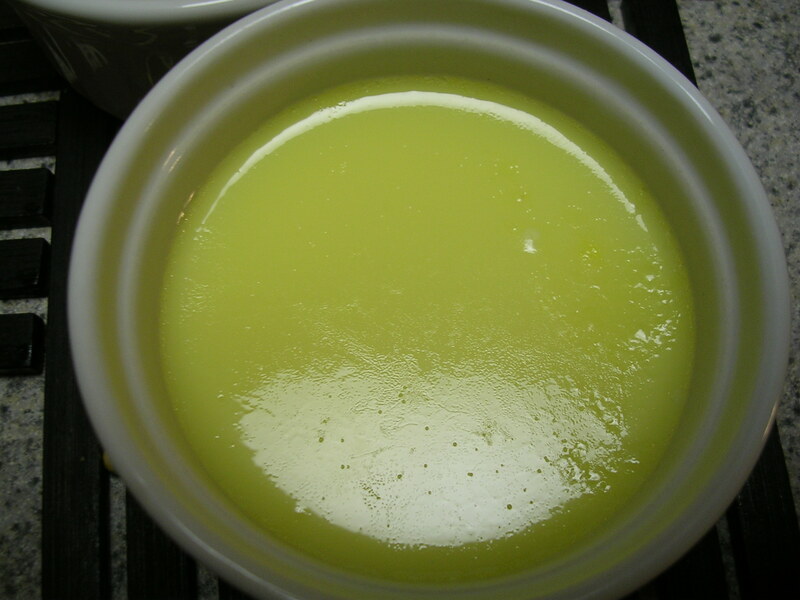 For the oil dough, it is too much lard(1.1cups) for only 2cups of flour. That will make the dough SUPER moisture?In step3, put both doughs in the freezer for how long?Thanks! This time, I successfully made the shells taste good. However, I don't know why my fill was not like your in the pics. It didn't firm and smooth at all. can i substitute lard with crisco? Janet, I'm pretty sure you can substitute the lard with Crisco. Good luck! thanks lucy, lookin forward to try this recipe! The egg tart seems very tempting, I will definately try out, by the way does AP flour stands for All Purpose flour? I think you can definitely try to make the crust thinner, but since I haven't tried it I can't promise anything. Let me know how it goes, I sure do think the mini ones are fun to eat at dim sum places! One more thing, can i substitute butter for lard/shortening? I made my crust wayy too thin so it became crunchy, but i like it that way xD. Thanks for sharing the recipe!